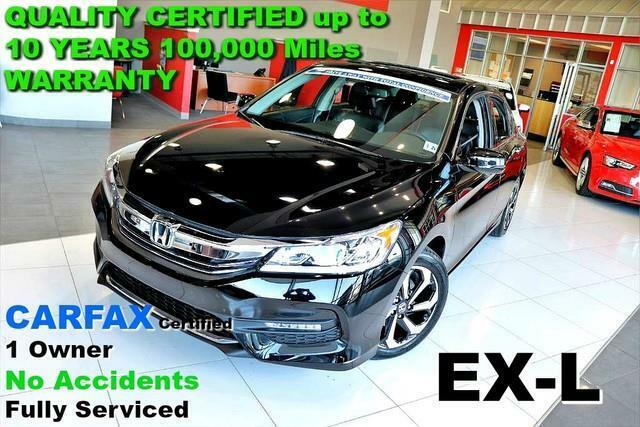 CARFAX Certified 1 Owner No Accidents Fully Serviced QUALITY CERTIFIED up to 10 YEARS 100,000 MILE WARRANTY Contact Quality Auto Center today for information on dozens of vehicles like this 2016 Honda Accord Sedan EX-L. The Honda Accord Sedan EX-L speaks volumes about it's driver, uncompromising individuality, passion for driving, and standards far above the ordinary. It's exceptional fuel-efficiency is a clear sign that not all vehicles are created with the same standards. This 2016 Honda Accord Sedan has such low mileage it has been parked more than driven. Beautiful color combination with Black exterior over Black interior making this the one to own! More information about the 2016 Honda Accord Sedan: The Honda Accord is very popular in the mid-size segment, continually selling at the top of a very competitive class. Prime competitors for the Accord include the Toyota Camry and the Nissan Altima. The Accord is a solid value, even in its humblest configuration. With its capable and sophisticated chassis, the Accord can feel quite luxurious when properly optioned. This versatility allows it to be either a spacious alternative to many economy cars or a less expensive alternative to many luxury cars. There is even a stylish coupe available with performance to match its already stellar platform. Interesting features of this model are wide variety of configurations available, Interior space, powerful and efficient drivetrains, and class-leading resale value No Credit / Bad Credit / No Paystubs, No problem !! ! All Approved ! Everyone drives ! CLEAN, GORGEOUS, LOW MILES, SHOWROOM CONDITION. CALL NOW QUALITY CERTIFIED up to 10 YEARS 100,000 MILE WARRANTY , To Certify a vehicle, there will be an additional cost for Certification. CALL NOW For details. STUNNING AGGRESSIVE LOOK ON THIS BEAUTIFUL--Call today to schedule a test drive... Good Credit/Bad Credit/No problem!!!! Get paid cash? No problem!! 100% Credit Approval with interest rates starting at 2.49% for qualified customers, our rates will not be beaten. We price our cars at wholesale price to guarantee the best deals for our customers. Our inventory moves quick, please call to confirm the availability of the vehicle of your interest Springfield location 973-564-0112. This vehicle is located at our SPRINGFIELD location. Come visit our new showroom in Springfield NJ.